Every year dozens of Klezmer bands from throughout Israel and from around the world descend upon Safed in order to participate in the city's much loved and anticipated Klezmer Festival. The festival features a combination of both solo and group performances and many well-known names in the Klezmer circle are always present. Bill Clinton has even been invited to perform in the yearly event! The festival takes place each summer is usually is arranged as a three day/night event. Concerts take place within the Red Mosque and other venues and many concerts are even performed outside in the crisp summer air. The entire city becomes alive during this time and all of the city's local artists set up their wares on craft tables along the main walkways. 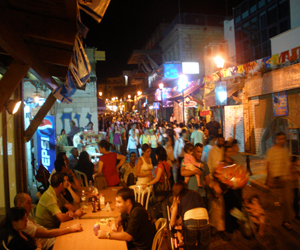 This is a festival not to be missed and if you have the opportunity to journey to Safed during this magical time then you will not be disappointed. Check out some of articles on personal experiences at the the Klezmer festival and also get all of the information you need to be an expert on Klezmer music by looking at our articles: Klezmer 101, Klezmer Background, Klezmer history, early Klezmer history, Hassiddic influence on Klezmer, Klezmer instruments, Klezmer tunes and dances, pre-WWII Klezmer, and Theatre and Vaudeville. In addition learn more about some of Israel's most popular Klezmer musicians and bands like Simply Tsfat, and enjoy our three part article on Ruby Harris, a fiddler and Klezmer musician. Stay tuned here at www.safed.co.il for all of the information you will need for this year's upcoming Klezmer Festival and find out all of the in-depth details about who will perform and when. For additional updates in English, Russian and Hebrew, check out Safed's muncipal site covering The Klezmer Festival. Tours, lectures, theater and a masters music school; these activities are free and are happening in Tsfat right around Klezmer time. Come to Tsfat for the exciting annual klezmer festival -- where it's now more than music!